Skype is a very useful app for connecting face-to-face with colleagues, friends, and prospects when you’re physically separated. Its video conference calls, screen sharing, and instant messaging are relationship-building tools we’ve come to know and trust. 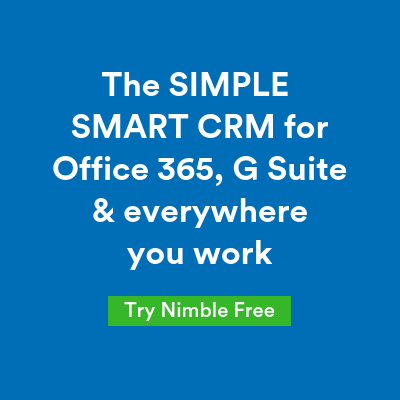 In this Modern Workplace post, we will cover how Nimble offers rich relationship insights and vital account intelligence to help you connect more effectively with the people you’re meeting, log follow up actions, and follow through on tasks directly on Skype. To begin, you will need to ensure that you have installed the Nimble Smart Contacts App to your browser. The Smart Contacts App enables you to bring Nimble with you anywhere you work on the web from Microsoft Edge, Chrome, Firefox, or Safari. Add new contacts to your account, as well as look up and take action on existing contacts. Next, visit Skype.com and select the option to “Sign in.” Then, select the option to use Skype online. Log into your Skype account and you will be brought to the browser equivalent of the Skype App. Now, you’re ready to access vital context and relationship intelligence stored in your Nimble database within the context of your Skype conversation, without switching tabs. To learn more about the people you’re meeting, open up the Nimble Smart Contacts App browser widget by clicking on the Nimble icon in your browser’s toolbar. The widget will open on the right-hand side of your screen and (if they are already in your team’s CRM) you can look up email, social, and appointment correspondence they have had with anyone on your team. You can also look up social and business insights about who your key contacts are and what their businesses are all about. 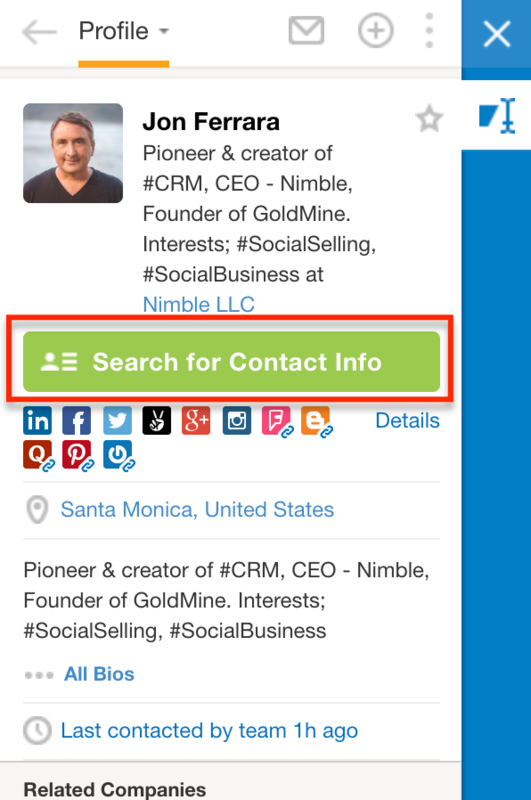 When you are ready, you can add the contact to Nimble to track and nurture the relationship by selecting the green “Add to Nimble” button. Nimble makes it easy to share contact profiles, edit records, add tasks, export them to Dynamics and more, just like you can using Nimble’s web app. Let’s walk through the actions you might take using the Nimble Smart Contacts app browser widget, starting with the three-dot icon in the upper right-most corner. Share Profile: Thinking of introducing this Skype contact to a colleague? The “Share Profile” option opens Nimble in a new tab and brings you right to a pre-populated email with the contact’s Smart Summary details, containing relevant information from social profiles that have been added to their contact record in Nimble. 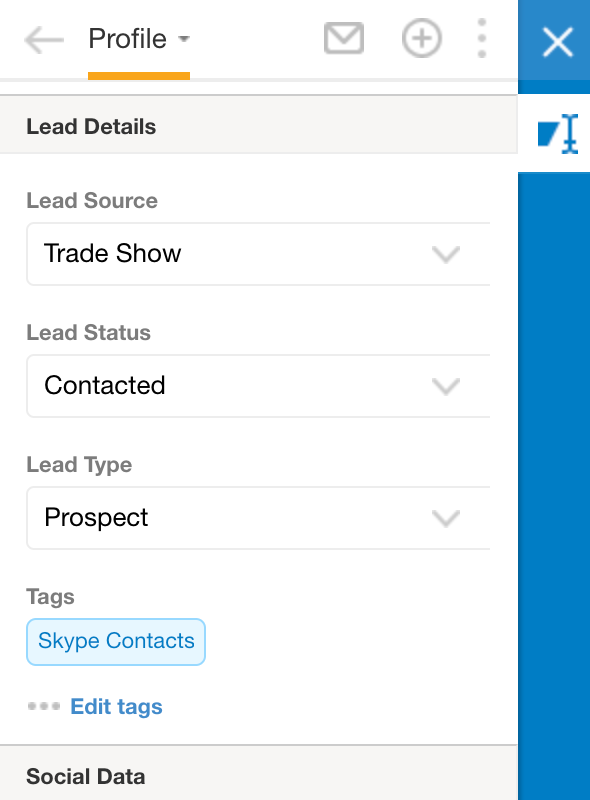 Enter New Data: While chatting with a contact in Skype, your contact might share sales intelligence — such as deal insights, a direct phone number, private email address, mailing address, or other information — that you’d like to record in the corresponding Nimble fields. Contact record access includes any custom data fields you may have created within the Nimble web app. Selecting this option enables you to add those details directly to their Nimble record. 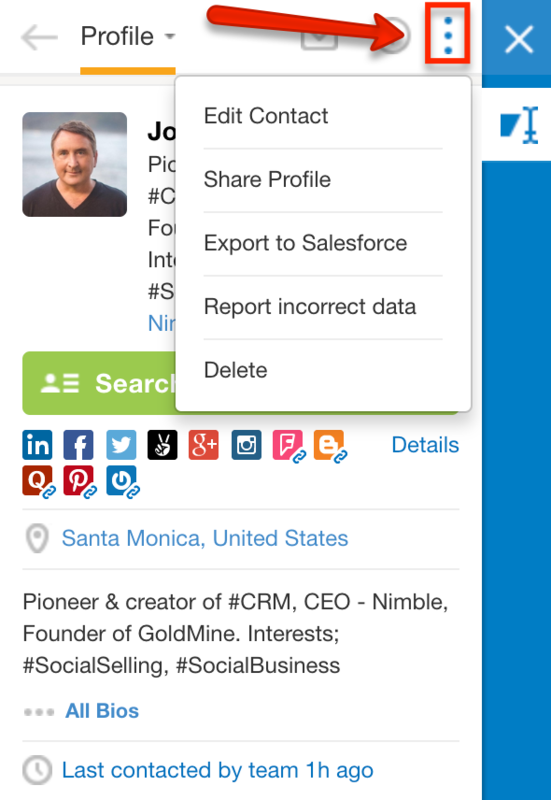 Report Incorrect Data: Enables you to mark social profile data as incorrect if needed. Delete: Deletes the contact from your Nimble account. Add Task: Set a follow-up reminder, or any other action item related to this contact to follow up. Add Note: Log a note regarding your Skype conversation in the contact’s Nimble contact record. Add Deal: Create a Deal (possibly a sales opportunity, or a project you may be working on related to the contact) on any pipeline you have created within your Nimble account. Add Log Touch: The “Log Touch” feature enables you to add a note to the contact’s Nimble record, and also provides you with the option to manually update the contact’s Stay in Touch reminder. This is great for logging notes about your Skype meetings. The envelope icon provides you with a variety of ways to communicate with your contact as a follow up, including email, Twitter mention, or direct message. Facebook and Linkedin options bring you directly to the corresponding message options on their respective networks. The contact’s record itself within the widget behaves exactly as it does when you are logged into the Nimble web app. You can mark your contact important or set a Stay in Touch reminder, as well as manage tags and Lead Details information. Additionally, our Prospector feature is available to help fill in any “blanks” for your contact, such as missing phone numbers, email addresses, and company addresses for contacts outside the EU. 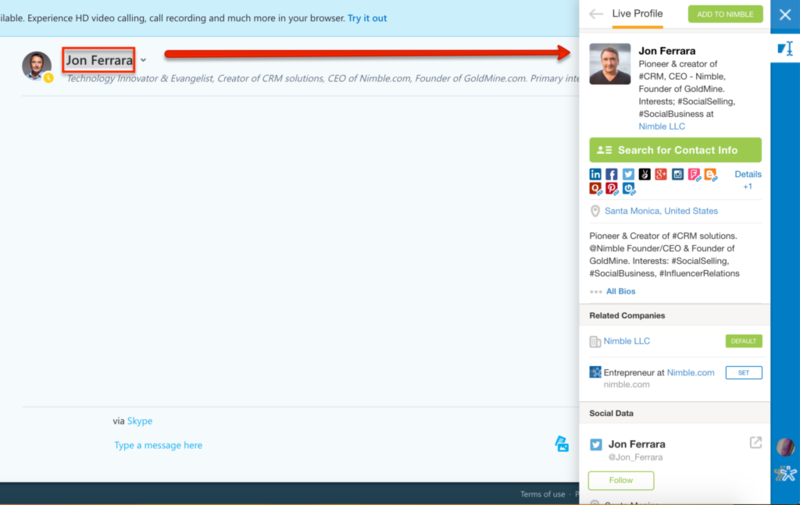 Simply click the green “Search Contact Info” button to get started, with just your contact’s First Name, Last Name, and Company Name/Domain. For a full walkthrough of this powerful feature, click here. 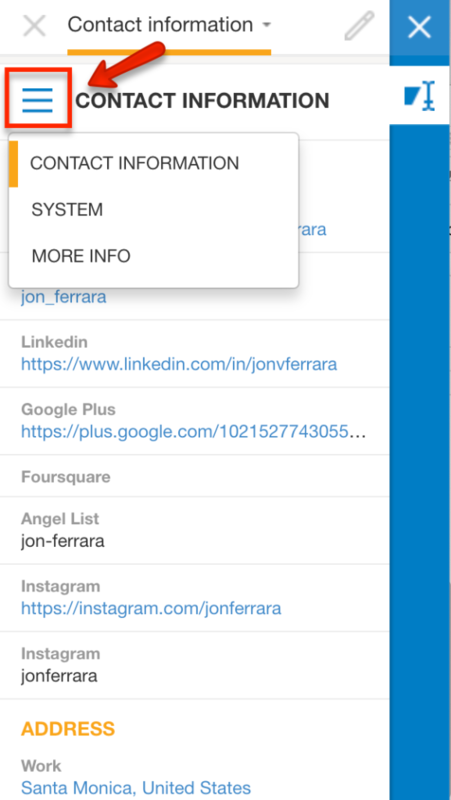 Lastly, the Nimble Smart Contacts App provides you with the ability to view all the information you have on file for the contact you are viewing. This can be done by either scrolling continuously, or by selecting the “Profile” option at the top of the widget. Smart Summary: Pulls together insights from social profiles that have been matched to this contact in Nimble, such as work experience, areas of influence, location, investment details if available, and websites associated with the contact. 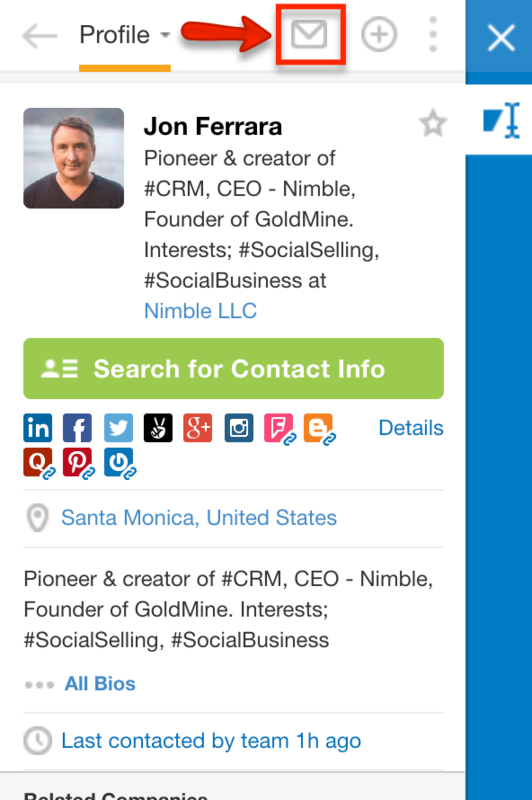 Social Profiles: A detailed listing of the contact’s social profiles. 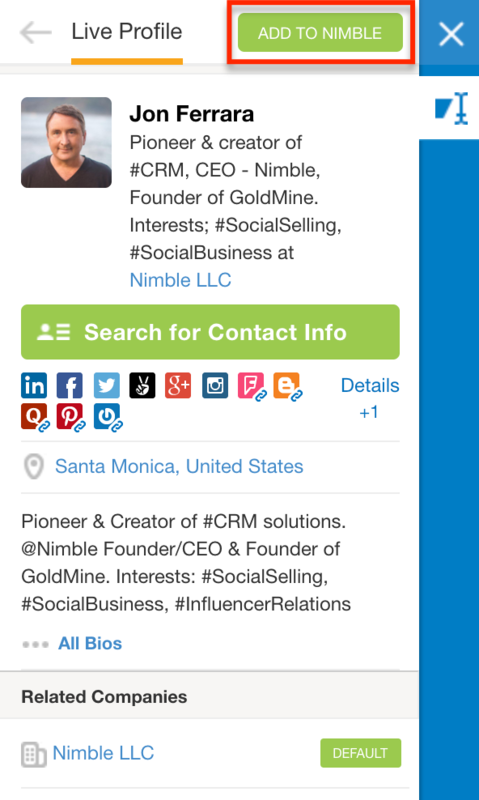 Stream: Review the contact’s Twitter stream directly from within Nimble, to hear what they are saying on social. This can be especially useful in making your outreach to that person a little bit more relevant and authentic if you’d like to reference any of these recent posts in your conversation with them. 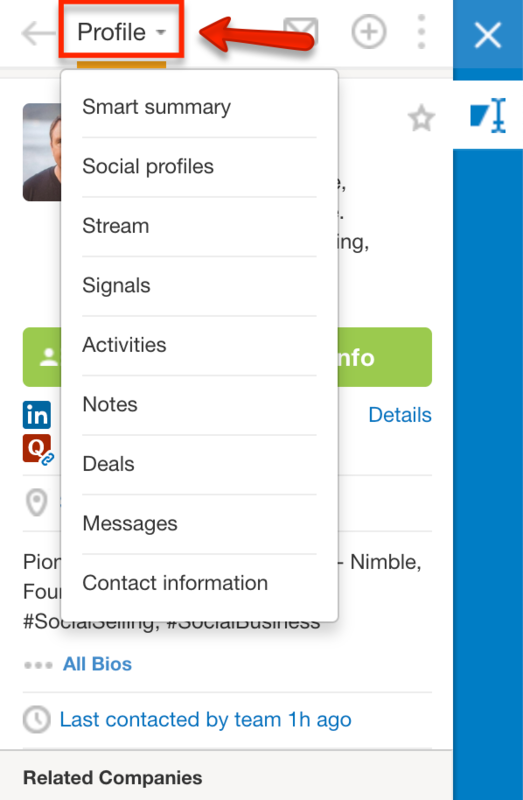 Signals: Easily keep track of all mentions and/or retweets of you from this contact via Twitter. Activities: Review upcoming and previous tasks and calendar events related to this contact. Notes: View any notes that you or your team members have logged on the contact’s record. 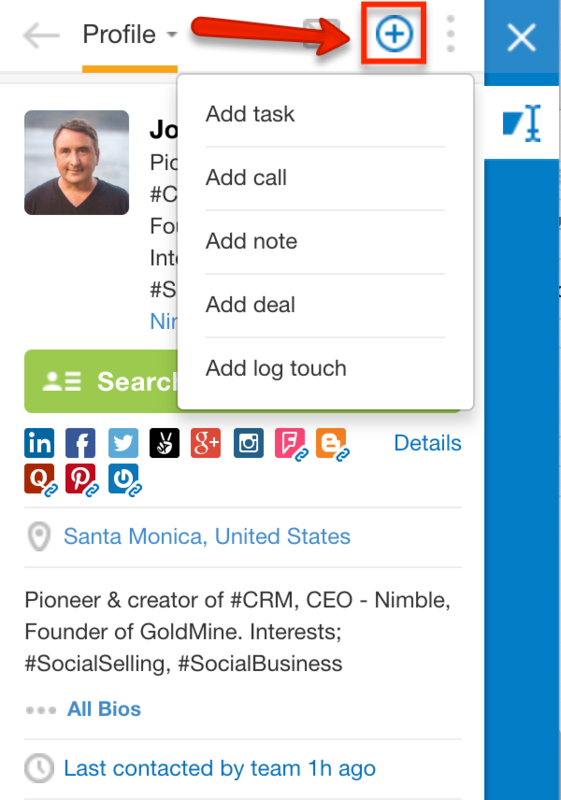 Deals: Check on the status of any deal listed on your Nimble pipelines. Messages: All of your email conversation history with the contact, as well as mentions, retweets, and DM’s from Twitter will be listed here. Using the Nimble Smart Contacts App browser widget within Skype on the web enables you to conveniently and effortlessly look up social and business insights about the people participating in the Skype conversation. 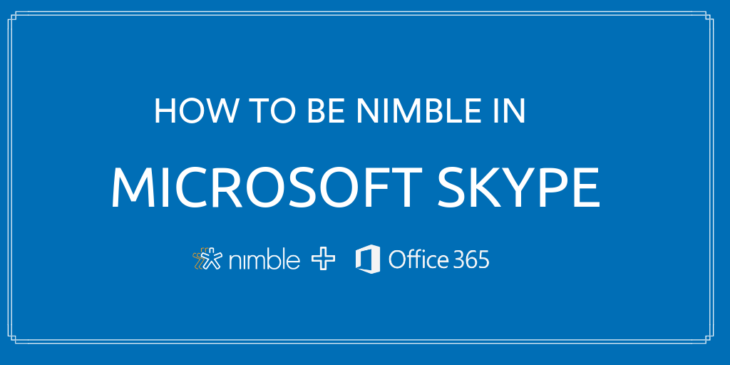 You can also add Skype contacts to your Nimble account and follow up by taking nearly every action that you would be able to while viewing their full contact record within the Nimble web app.